The Weddington Warriors will square off tonight against the Southeast Guilford Falcons for the 3AA State Championship Game at Kenan Stadium in Chapel Hill. After four and a half months of football, the lone Union County team in the playoffs, the Weddington Warriors have an opportunity to win its second state title in three years if they beat Southeast Guilford. Both teams come into this match-up with identical 14-1 records, and both sides boast strong offensive attacks and stout defenses. Weddington's defense overlooked by some has elevated its game in the playoffs. The Warriors entered the postseason holding their opponents to 13.9 points per game. In Weddington's four playoff games, the defensive squad has lowered that number to a single digit- allowing just eight points per game. Thanks to a fan earlier in the week who informed me that since the loss to Charlotte Catholic on September 28, the first team defense has not given up more than one touchdown in a game. One interesting note (to me anyway)- although tonight the game officially is listed as a neutral site game, this will be Weddington's tenth game away from home. The Warriors have an 8-1 road record this season and have played three out of their last four playoffs games on the road. Conversely, Southeast Guilford is 4-1 on the road, but they haven't played a game away from home in two months! October 12 was the Falcons last road game. 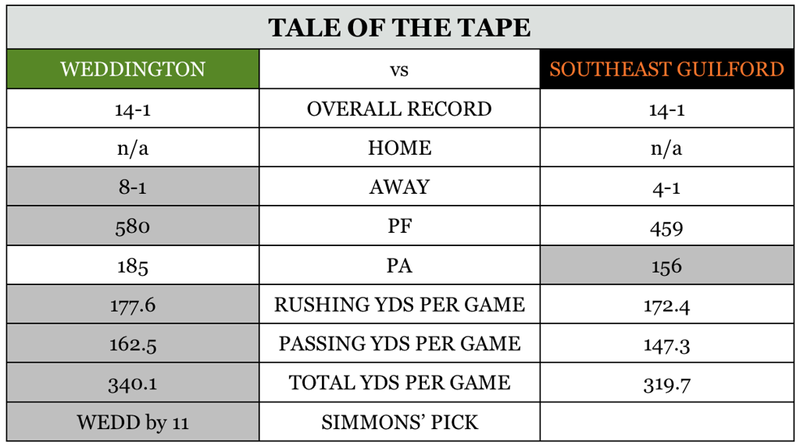 When comparing the stats, the teams are similar, but Weddington's strength of schedule was considered tougher than that of Southeast Guildford. The Falcons quarterback is a dual-threat QB, and Weddington has played against the best dual-threat QB in the state over the last four years in Sun Valley's Sam Howell. The forecast for tonight is rain and more rain on top of Kenan Stadium's natural turf that received 10 inches of snow Sunday into Monday. A tarp never covered the field and snow removal began on Wednesday. We will not be looking at ideal conditions tonight, and the field surface will worsen with each passing minute of the game. When the weather plays a factor in a football game, football stats mean little, the weather can be a great equalizer. That said, it also can elevate and magnify the importance of special teams play and players specifically for Weddington, James Shipley and kicker, Ian Williams. In this department, Weddington has a clear edge and should benefit from the punt return experience and skill that Shipley brings into this area. The senior has returned one kickoff and four punt returns for touchdowns this season. Ian Williams' kickoffs, 86% resulting in touchbacks that create a longer field for the opposing offense. The junior kicker also delivers booming punts that could take Weddington out of bad field position and put Southeast Guilford into the same. It's also tougher to pull down a booming punt in a large stadium with rain falling. Field goals might be an issue since footing and ball placement are critical- the Kenan Stadium surface may not be too forgiving tonight. Regardless, Weddington has a wealth of playoff experience on both sides of the ball that should serve them well in tonight's game. Field position and turnovers could be the difference. Southeast Guilford has made it a habit in this postseason with come from behind victories. In their last two games, they trailed Dudley and Cleveland by 12 points and came back to win. If Weddington gets a 12-point lead on the Falcons tonight, I have a hard time thinking that defense would allow a third-straight comeback. Included in the stat comparisons below, you will also see the pick of Brian Simmons. Last week Brian was 2-0 (100.0%) on picking winners, 2-0 against the spread. Overall, in the postseason, Simmons is 10-4 (71.4%) picking winners and 8-5 (61.5%) against the spread, one game was an even spread.